It’s that time of the year again: The first few months flew by so fast you did not even spend a second planning your summer vacation. Been there, done that! Yet, all of a sudden our Instagram is floating with beach pictures, city breaks and roof-top parties in foreign lands. To avoid a summer filled with frustration and anger, the only chance to compensate this lack of planning is to take a spontaneous summer trip and if you’re like us, chances are you’re either too busy to stay away for more than a weekend, or having been too lucky in the past to chose a go-to destination like Paris or Rome as you already had the chance to admire these beauties first hand. The capital of Malta is probably one of the most underrated cities in Europe - C ends up going back over and over again after having lived there -. 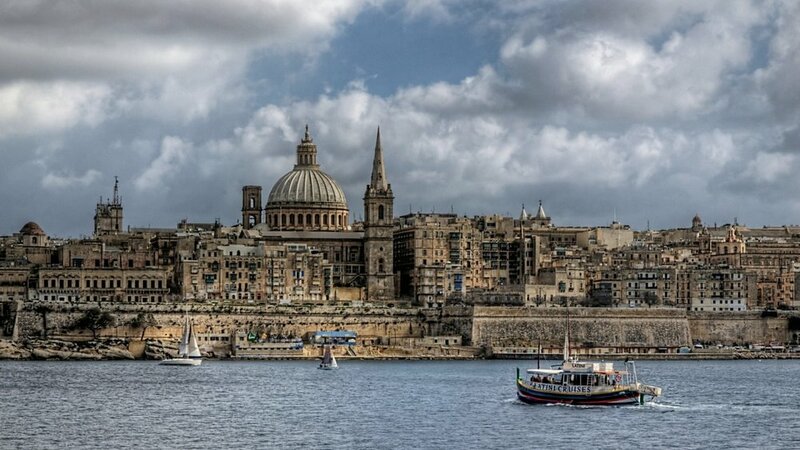 To be fair, it is not a huge metropolis, but despite its small size Valletta has a lot to offer: Being located directly at the waterfront, the city has two natural habors which are very inviting for boat trips (and parties!) and long walks along the waterfront. Furthermore, you should not miss the two most important cathedrals St. Paul’s and St. John’s and the Upper Barrakka Gardens. This public park is the highest point of the city walls and consequently offers a spectacular view over the city and the Grand Harbour. And if you're already at it, end the night in the beautiful Manoel Theater! A little bonus?! The entire city is one of the UNESCO World Heritage Sites! Marseille is not only host of France’s most important port, but also the perfect destination for a weekend getaway! If you want to experience some French "joie de vivre", Marseille is the place to be. Fall in love with the „Le Parnier“ neighborhood and its colorful little houses and enjoy the sunset at the „Vieux Port“ (old haven). There are also „Les Calanques“, a stretch of coast between Marseille and Cassis where your soul can let go of all the stress you might have back home. A definite must-see is the „Notre Dame de la Garde“ cathedral. It might look unfeasible to walk up all the way to the top but you will be rewarded with an amazing view over the dreamy city and the sea! They say „See Venice and die!“ and this definitely speaks for itself! Venice should be on everyone’s bucket list. It is not only one of Italy’s top travel destinations but by far one of the most famous cities in the world! This is little surprising: With all the small canals crossing the city, you cannot help but get into the romantic spirit that is flowing through the city. Gondolas wherever you look do this even more justice. One of Venice's biggest waterways is the Grand Canal, with Rialto Bridge being the most popular one. Make sure to pass the „Piazza di San Marco“ the main square of the city. In addition, it is definitely worth planning a trip to Venice’s two neighborhoods „Murano“ and „Burano“, two beyond cute small islands. Valencia, one of Spain’s most important cities is another one of our definite must-see destinations! Not only is it España’s third largest city but also offers everything you could ask for during your weekend getaway: Thanks to its diverse architecture featuring old and new buildings and the beaches close by, you can get a feel for the city vibes while also getting the sensation of a genuine beach holiday. Valencia also hosts the City of Arts and Sciences, a group of futuristic buildings, including six different zones. Furthermore, you should definitely not miss Valencia’s Central Market to buy some delicious Spanish food, all while getting a glimpse into the life and culture of the city's citizens. Culture-wise, turn to the historic quarter „El Carmen“ with its various palaces. Finally, if you are still hungry for knowledge, rest assured that there is no shortage of museums in Valencia. The city has a total of 34, save to say there's something for everyone. While most people are going South for their summer vacation, why not head North? There are good reasons for a Scandinavian weekend getaway and one of them is called „Copenhagen“. Denmark’s capital is such a colorful and exciting city that you won’t even miss the beach! The Little Mermaid -Yes, like the movie-, is Copenhagen’s most famous tourist attraction and turned 100 years old in 2013. The Kronborg Castle, which you might recognize from Shakespeare’s Hamlet, and Freetown Christiania, a colorful neighborhood founded by hippies in 1971 should be on Denmark's not-to-miss list, neither. And after an extended shopping trip in Copenhagen’s largest shopping area Strøget -If you're anything like us, shopping is a never-to-be-missed, no matter which destination you travel to, you might want to end the day with a delicious dinner and a relaxing walk at Nyhavn, Copenhagen's popular port for locals to get together and relax. I am pretty sure that you have heard of Cinque Terre (five worlds) by now. The coastal strip has been Instagram’s rising star these past few years. Just think of all the colorful little houses located at the sea... et voilá, this is Cinque Terre located along the Italian Riviera. The dreamy location is composed of the five „villages“ Monterosso, Vernazza, Corniglia, Manarola and Riomaggore. The community's biggest influencers have already proven that Cinque Terre is the hidden gem when it comes to relaxing like a celebrity with the most picturesque scene only imaginable. As a plus, when visiting Cinque Terre you get to enjoy the Italian way of life which means sunbathing close to the water during the day and partying at night... and of course: the Italian food! A vacation full of pizza, pasta and gelato... we’re in! Located in the Southern part of Germany, the city acts like a magnet during Oktoberfest season. But there are also eleven other months in a year and at least just as many reasons to visit the Bavarian city. How about cheering for Germany’s most successful soccer team Bayern Munich in their „Allianzarena“ stadium or visiting the „Olympiapark“, which was built for the Olympic games in 1972 and is comprised of some of the city’s most important buildings? A must-see is also the „Frauenkirche“, the city center's cathedral and one of Munich landmarks. And if your beer lust is getting the best of you, just pay a visit to the famous „Hofbrauhaus“ to enjoy a genuine Bavarian beer. Cheers to that! They say Paris is always a good idea but we are sure that other European cities can be just as magnificent! Good luck deciding where to go this summer! NOT IN THE MOOD TO WEAR STRAPLESS?